The race is on at Jackpot Capital Casino this month as players compete for $80,000 in casino bonuses. This summer, the dark knight rises and Batman is on a quest to restore his good name. 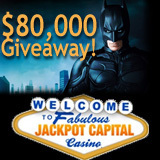 Jackpot Capital players will be joining the caped crusader in his pursuit. Players are automatically entered in the $80,000 Dark Knight Casino Bonus Giveaway whenever they deposit and play. At the popular online casino, players earn points as they enjoy its slots and table games and these points move them through their mission to rescue Gotham City. There are several stages along the way. Players at every level will be eligible for casino bonuses but when bonus winners at each station are drawn on August 21st, the biggest prizes will go to players that have earned the most points, made it to the final station and saved Batman. Contest details and current rankings are available at: http://promotions.jackpotcapital.eu/darkknightrises. In addition to grand prizes awarded August 21st, every Monday until then 150 players that have played over the previous weekend will receive a Weekend Bonus. During the $80K Dark Knight Giveaway, a 100% deposit bonus (up to $200) is available. The coupon code for this bat bonus is “GOTHAM200”. Jackpot Capital has more than 300 games from Real Time Gaming (RTG) including million dollar progressive jackpots such as Jackpot Piñatas, Caribbean Hold´em, Mid-Life Crisis, Shopping Spree and Aztec’s Millions. The online casino is popular around the world and is well known for its easy deposits and withdrawals. Casino staff stay in touch with players on the casino’s Facebook page: http://www.facebook.com/pages/Jackpot-Capital/391828100507.